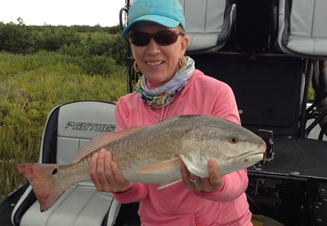 Marylin Evans and Debbie Williams arrived on Wednesday for some fruitful kayak fishing in Goose Park. Still others, Diane and Richard Blair and Kay and Les Jackson, arrived on Thursday for some early kayak fishing on Friday. By the weekend, the fish were hard to find during the day. 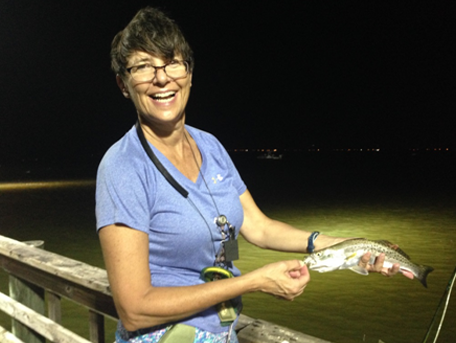 Some very prolific night fishing under the lights of the piers “netted” Tammy Notley her first salt water fish and Mary Rohrer her first speckled trout. The Friday night Mullet Mixer was very well attended with lots of yummy food and drink. We all gathered on the corner of the pool patio for some salt water fishing discussion led by Mary Rohrer. Diane Blair worked her “texting magic” and kept us all appraised of the fishing/birding/bait activity from our numerous scouts throughout the weekend. What would we do without cell phones…? 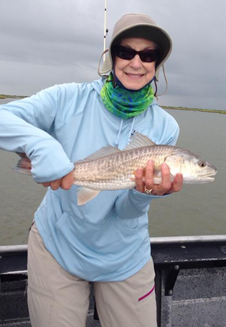 Several folks hired guides on Saturday and had some marginally better luck tracking and finding fish. Attendees this year were: Robert and Sheila Anderson, Emery and Janet Baca, Jim and Pat Bass, Diane and Richard Blair, Pat and Don Carlson, Joyce Davis, Marylin Evans, Karen Gebhardt, Gretchen Gettelman, Beverly Gordon, Carrie Helcamp, Pam Holland, Kay and Les Jackson, Mary Kain, Sharon Leissner, Eric and Lori McElroy, Tammy Notley, Cindy Organ, Mary Rohrer, Kerri and Jim Stephenson, Diane Wessels, Linda Whiddon, and Debbie Williams. Robert Anderson’s Saturday evening shrimp boil was excellent, as always. He puts on a good spread. Pat Carlson and the other TWFF officers held a brief business meeting during dinner on Saturday. Sunday morning brought a beautiful sunrise on the beach. By the time I got moving though, everyone was coming in and packing to leave. Oh well…, there is always next year to catch the early morning sunrise. All-in-all, I think everyone had another wonderful time at the coast this year.